The size of your fidget blankets is up to you; the dimensions below make a lap mat as per the photo that can be tied at the waist or positioned on a table with velcro. Volunteers and sewing machines. Not all volunteers need to know how to sew; they can decorate, cut fabric, and separate items for personalised mats. Decorations: Leftover wool, strings, buttons, zippers, buckles, bells, fabric in different textures, soft toys, squishy and squeaky items, key rings, beads, and more. Finish mat’s open side by folding inwards and sewing shut. Sew all around the 4 sides of the mat once more to finish the base. Use your imagination; anything interesting and safe is suitable. Decorations should be securely attached to fabric for safety reasons. For example: Sew on a zipper, attach buttons, make a button hole for large buttons with button flaps, sew in a bunch of wool strands (about 7 inches/18cm - to be braided); attach belt and buckle, sew in a fluffy piece of fabric and leather, attach pom-poms, squish toys, and more. Attach soft toys, sew in a little pocket, large colourful beads, key ring and attach it to mat. Mats may be personalized, e.g. if the client was a hairdresser, attach things she would recognise and enjoy to touch. You may wish to make it into an apron by placing ribbons on the sides. Remember that people living with dementia must be supervised. Thanks Janet! We would love to see a pic when you are finished! Love the simplicity of your instructions. 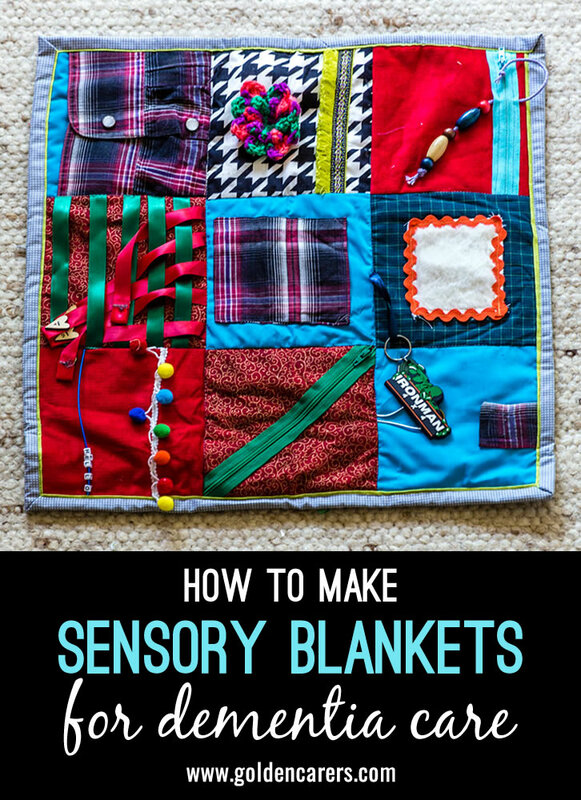 I can't wait to make a sensory blanket for my grandma.